Phone Number - Phone number that was called by the voice broadcast system. 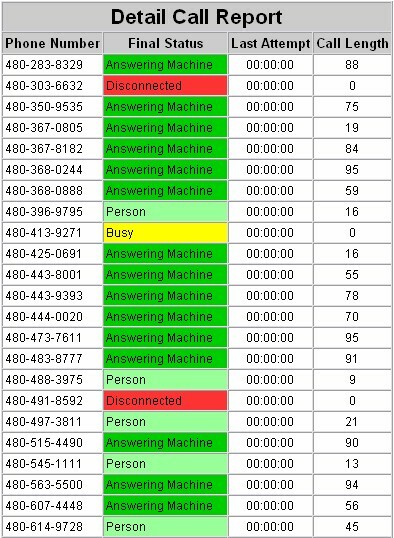 Final Status - Final disposition of each phone call (Answer, disconnect, live, etc). Last Attempt - Time of day when the last call attempt was made. Call Length - Amount of time in seconds of the last phone call attempt. DSC can provide your organization with a complete, turnkey voice broadcasting phone system. If you need to get a project or campaign started immediately, we can provide your organization voice broadcast outsourcing at our multiple call center locations. These services are ideal for political calls and community or customer notifications. The following is a list of some of the features and options available with our voice broadcasting service.